Mozart at 30, Haydn at 65, Beethoven at 21, each man spinning out and showing off his piano trio chops in different years: an afternoon in the great hall of an upper-class mansion at the end of the 18th century certainly was a delightful and instructive way to spend time last Sunday afternoon. Oops, pardon the time travel. The pleasantly sized high-ceilinged auditorium in First Parish in Lincoln’s Richardsonian stone Parish House may have been historically on the plus size, but listening there to the keenly expressed work of the Boston Classical Trio playing on period instruments made it easy to imagine a very high-quality chamber concert of 200+ years ago. The free event, underwritten by First Parish, featured three Handel & Haydn Society musicians, violinist Susanna Ogata, cellist Guy Fishman and keyboardist Ian Watson, who as well is the church’s new music director. They make a superbly agile group, down to earth, focused on clarity, structure, and point as much as beauty. A related element that contributed to the time travel was their unpretentious get-on-with-it quality, not exactly jazz-like improvisation (although Ogata also has firm footing in both jazz and contemporary classical music) but un-fussed, “un-porcelain” music-making unfolding in real time—whether today or long ago. 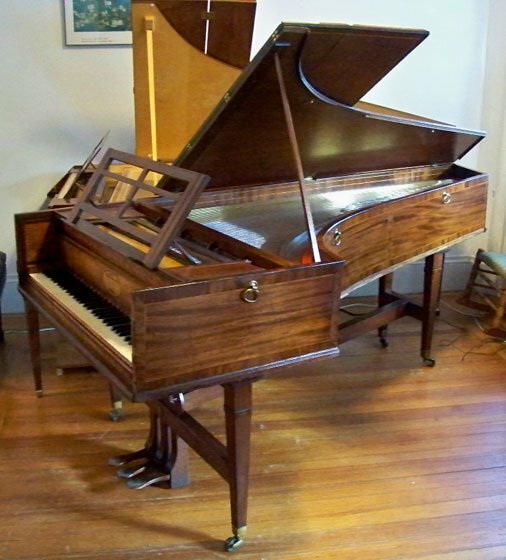 Mozart wrote his K.502 B-flat Piano Trio in 1786, and it served as a perfect opener. Even with the effortlessly tumbling forth, self-writing quality that Mozart invariably shows, the piece is finely wrought, with all manner of formal harmonic surprises and novel touches. The wordless opera of the Larghetto is practically as beautiful as anything in Mozart, meaning as beautiful as music can get, and one may stop paying attention to form and most else. The final movement Allegretto, full of drama, was, under the hands of the Boston Classical Trio, more dramatic than some recordings using modern instruments. Anchoring all, Ian Watson is a terrific, energetic pianist in the unobtrusive ways: economical of technique, rhythmically sturdy, unflagging when cornering. His technique is un-showy, close to the keys. Not the last word in delicate coloring, perhaps, but I would listen to him play anything. Ogata and Fishman expertly parried and synched like the gladdest of teammates. Haydn’s Piano Trio in E major (no. 4 or 44, depending on the catalog; from 1797) is a masterly, dramatic later work and for me was the high point of the concert. Haydn is ever sly and, at his very best, as here, includes many positively LOL moments. The short, striking second movement Allegretto lives on a somber, minor-key walking bass (starting in the keyboard left hand) that uncannily calls through the centuries to any jazz piano trio with upright bass. The Allegro finale overflows with amusing staggers, stops and starts. The performance almost made Haydn seem master above all others. Period-instrument concertizing at this level of idiom and quality is such that in each piece it became easy to follow the very different sonata arguments: presentation of the themes; developments; recaps. That is, when not hypnotized by the beauty and wit of the composing. And the playing sounded in almost all respects unimprovable. The afternoon concluded with Beethoven’s first published piece, the well-known E-flat Piano Trio op. 1 no. 1, from 1792. Now we were listening to a new and younger master, in Beethoven’s usual “Here I am” voice. More and different drama, more soloing and duetting, more-demarcated accompaniments, more-pointed (sometimes misleading) tutoring in the ways of form, and for now taking four movements, not three. Ogata’s tuning flattened a little bit in the lower registers but returned to bright and true for the higher material. Fishman and Watson dug in and rocked out. A fine ending to a fine concert. Munschy’s narratives aside, an opportunity for some thought-provoking cultural history instruction was missed, given that these three trios were written over the span of only 11 years by the three commanding Classical composers, all of whom were highly influential on one another as both student and teacher. Indeed, to that end, the pieces might have better been played in chronological order. The very next year after Mozart wrote his B-flat piano trio, the 16-year-old Beethoven visited Vienna and likely had a few lessons with him. Five years later, with Mozart suddenly dead, the 22-year-old Beethoven commenced study for a few years with the 60-year-old Haydn, who himself had been a leading booster of young Mozart (famously giving his imprimatur to Mozart’s stage-mother father the year before K.502). Haydn’s own music deepened after Mozart’s death. Soon, ambitious upstart student Beethoven and esteemed teacher Haydn had a falling out over these career-leadoff trios: Haydn thought they might be a bit much for the public, so to enhance their chances Opus 1 should be published with “pupil of Haydn” under Beethoven’s name on the cover. Though the pieces were performed as a sort of welcome-home for Haydn after a successful London tour, Beethoven bridled at the front-page suggestion, and soon was telling people he’d never learned anything from the old man. Haydn went on to write many more piano trio masterworks, including, five years later at 65, the E-major. Eventually Beethoven resumed his admiration of Haydn, and he came to refer to the aged master reverently, as the equal of Bach and Mozart; at Haydn’s 76th birthday concert, the year before the older composer died, Beethoven knelt and kissed his forehead. That was around the time Beethoven finished his Fifth Symphony, and, while of course a continuum, European art music was leaving the rich world of Classical style, transforming itself urgently toward something rather different and unknown.